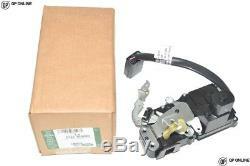 BRAND NEW GENUINE RANGE ROVER P38 LEFT HAND DRIVE FRONT DOOR LATCH LEFT SIDE. AS THE DOOR LATCH IS A GENUINE LAND ROVER PART IT IS OF THE HIGHEST QUALITY AND IS BETTER THAN ANYTHING ELSE AVAILABLE ON THE MARKET. MODELS FROM CHASSIS NUMBER YA430702. Our items are dispatched with the same or the next day depending on the levels of stock. The item "RANGE ROVER P38 LHD GENUINE LEFT FRONT DOOR LATCH FROM VIN YA430702 FQJ103290" is in sale since Thursday, May 5, 2011. This item is in the category "Vehicle Parts & Accessories\Car Parts\Other Car Parts". The seller is "qponlineltd" and is located in Barking. This item can be shipped worldwide.